Gabrielle proves herself a diligent snow shoveler with winter's first snowstorm at Pirate's Cove. 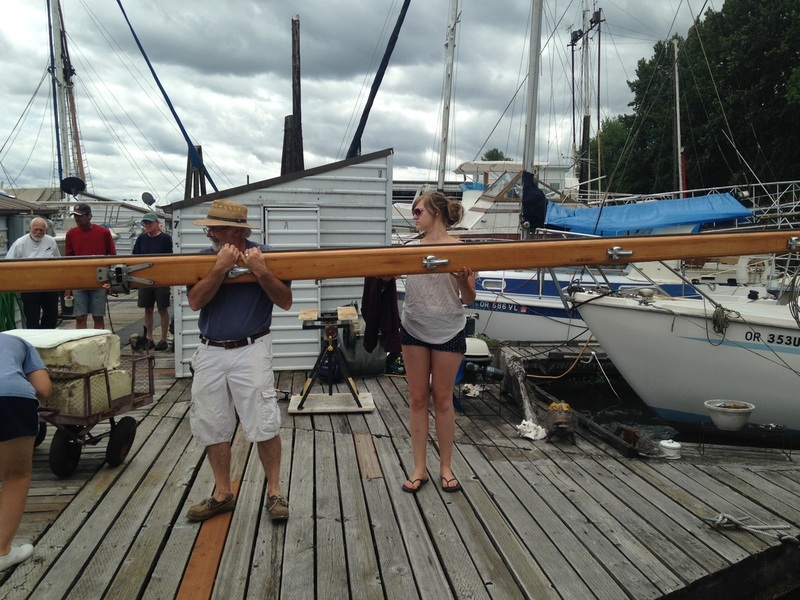 Well, November and December of 2013 were pretty much a bust, from a boatbuilding perspective. 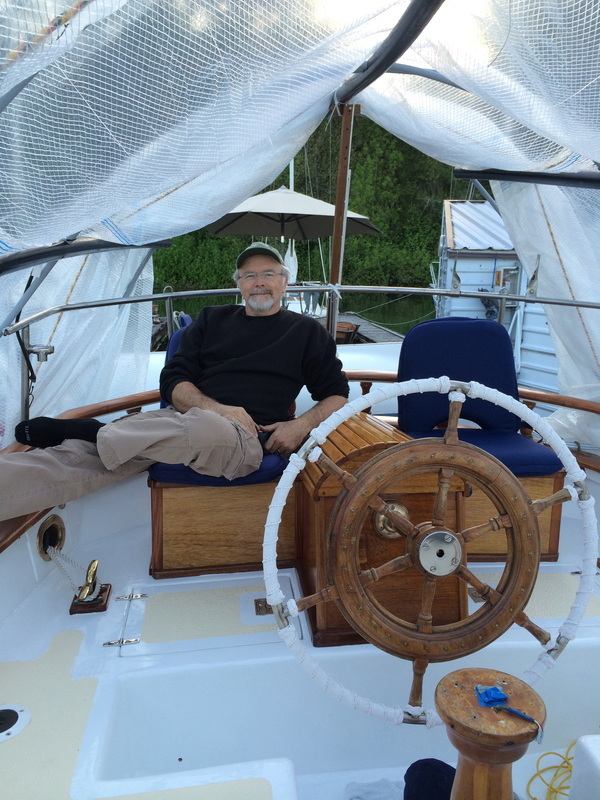 Michael was the proud father of a kidney stone, that put him out of circulation for a while, and holiday activities graciously provided us with opportunities to reconnect with people who are dear to us. 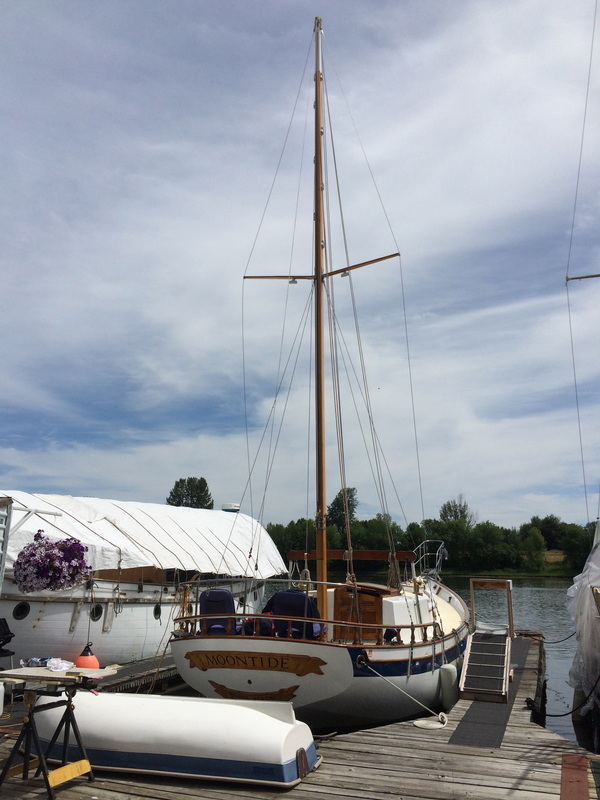 Life-Balance is not always easy when folks endeavor to restore their home, be it a house or a boat. The Weather also had a few things to say about our project. 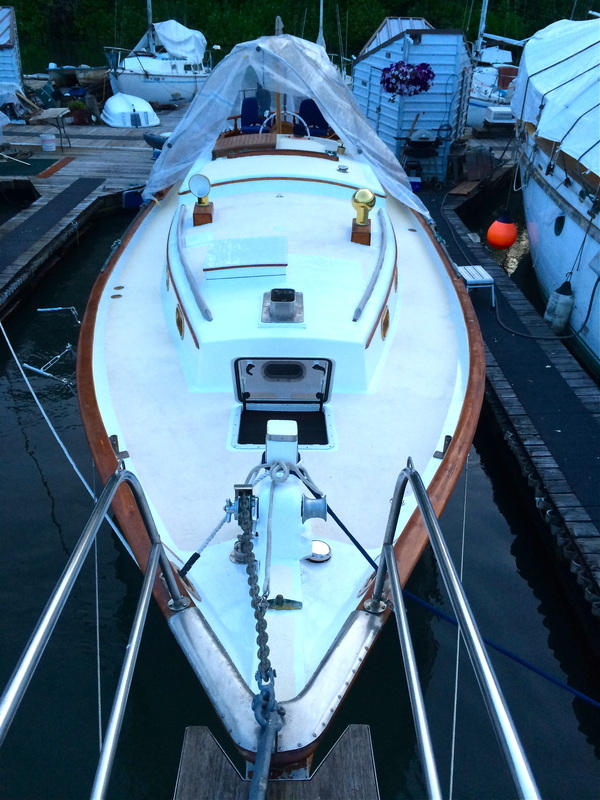 It seems epoxy does not cure well when the temperature drops below freezing! With the New Year came the realization that, if we were going to find a place to store a backup propane tank, now, with the deck still open, would be the time to do it. 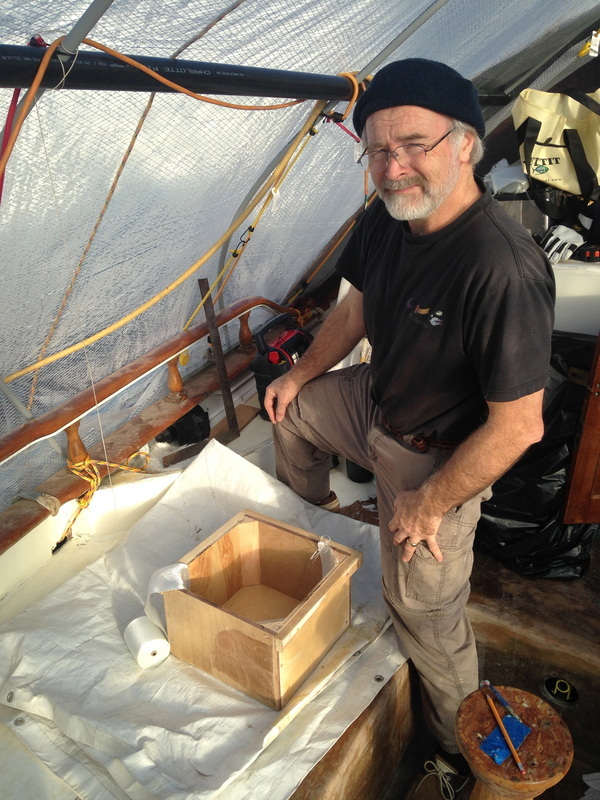 We cut open a space under what will become the starboard 'saddle bag seat' and Michael built a fiberglass coated box with a vent to attach to the hole. 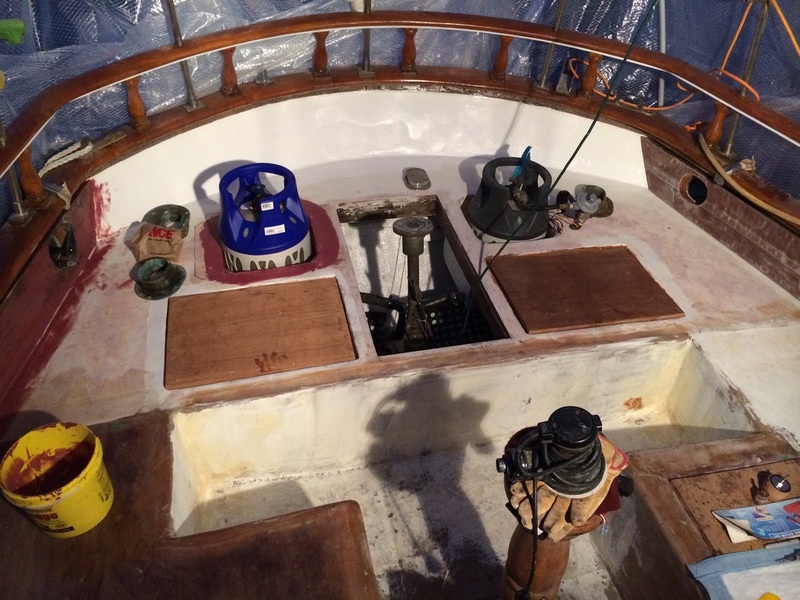 A new hole in the starboard side of the cockpit. Voila! 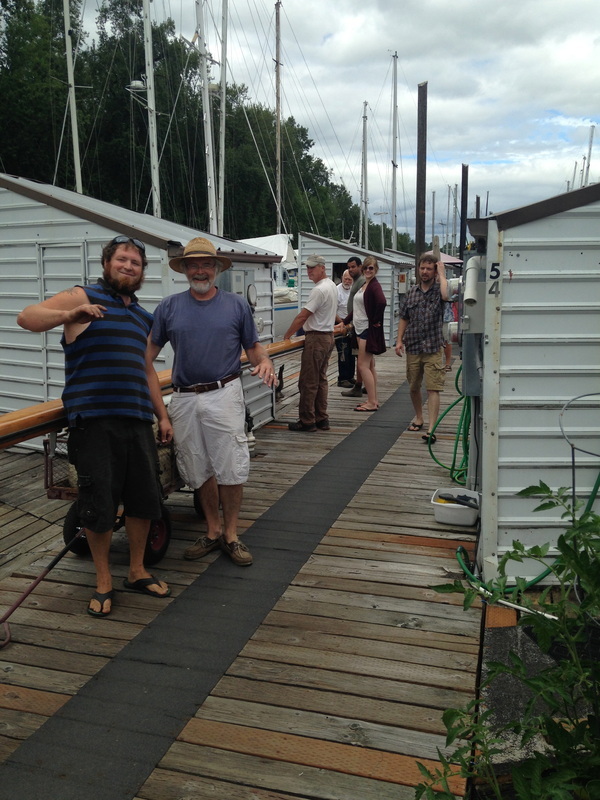 a new storage space for propane tanks! Seal it up so it doesn't rot again! 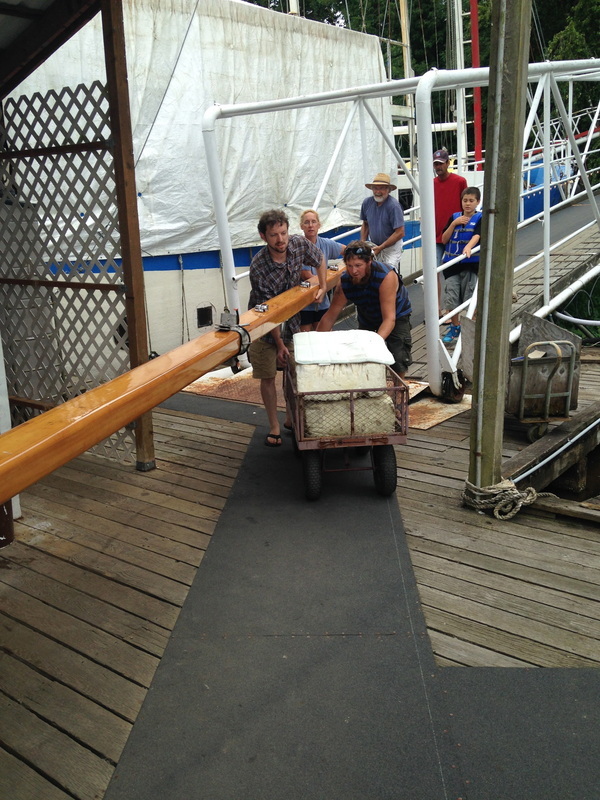 Note the Propane heater to help the epoxy dry. 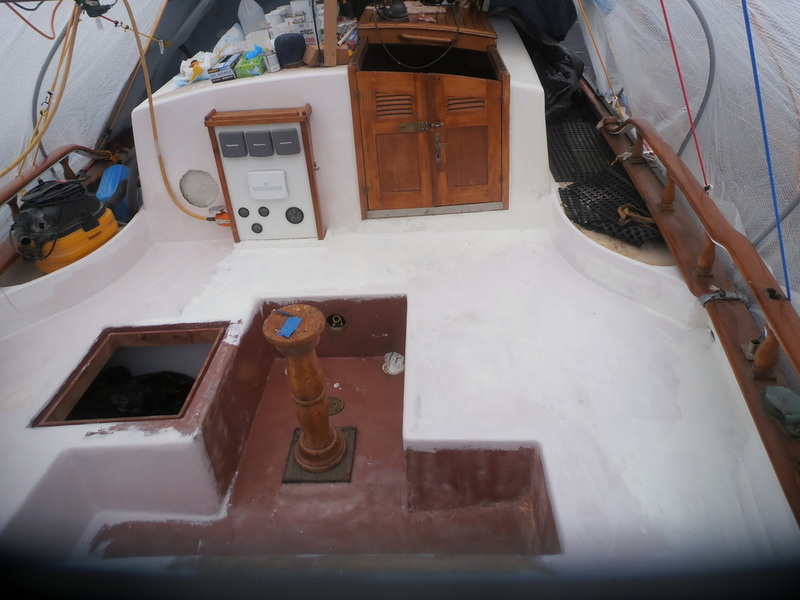 Now comes the layering process, where we first epoxy the joints and screw holes, then lay down fiberglass, and finally build layer after layer of epoxy onto it to seal the deck, round the corners, and make a surface worth painting. 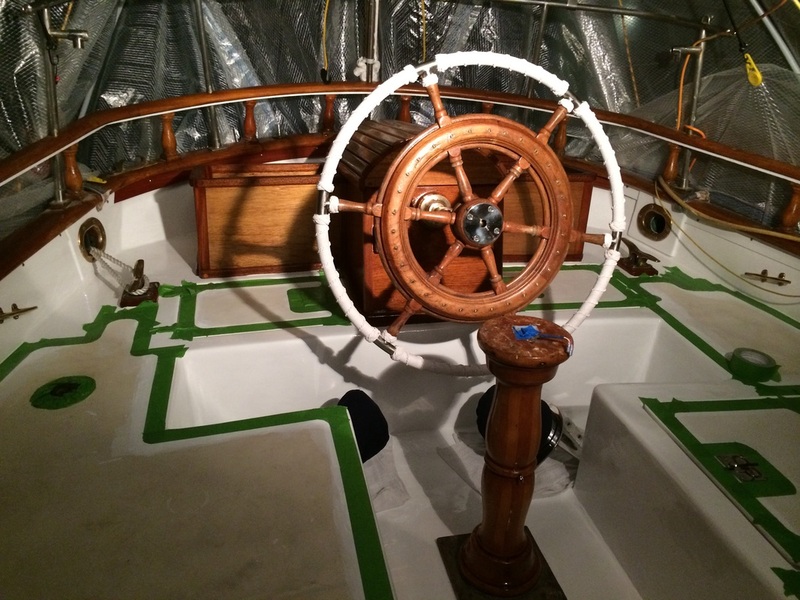 This job entails hours of sanding between coats to smooth surfaces and remove runs and imperfections in the epoxy. Various density fillers blended into the epoxy give different colors to the finished product. 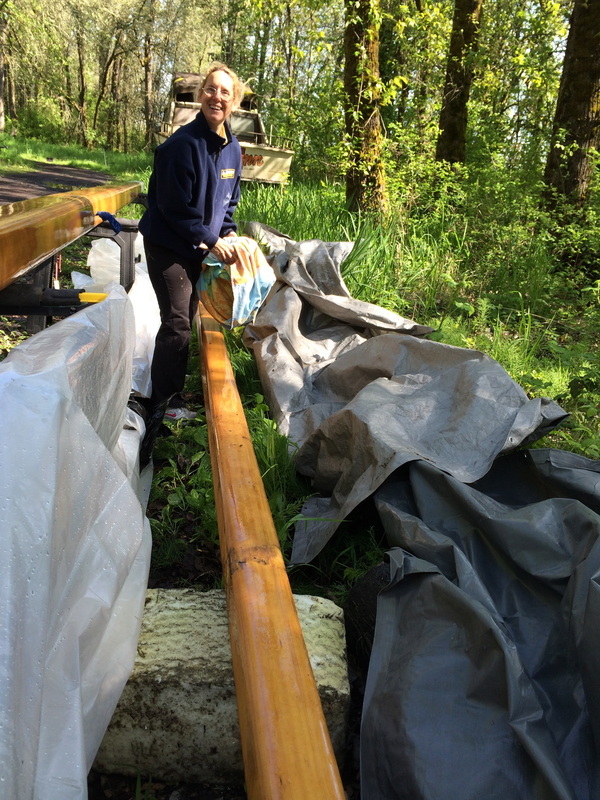 a little white dye helps inspire the workers as to what the finished product will look like. At this stage of the game, we can use all the inspiration we can get! Anyone who has ever done a major remodel of their home, no doubt, will understand. 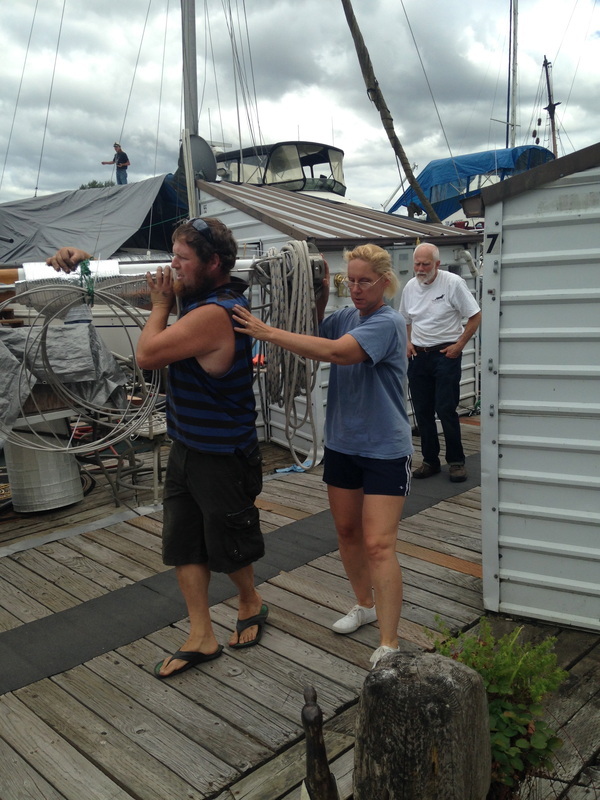 Both of us are more than ready to have the boat back in one piece!!! 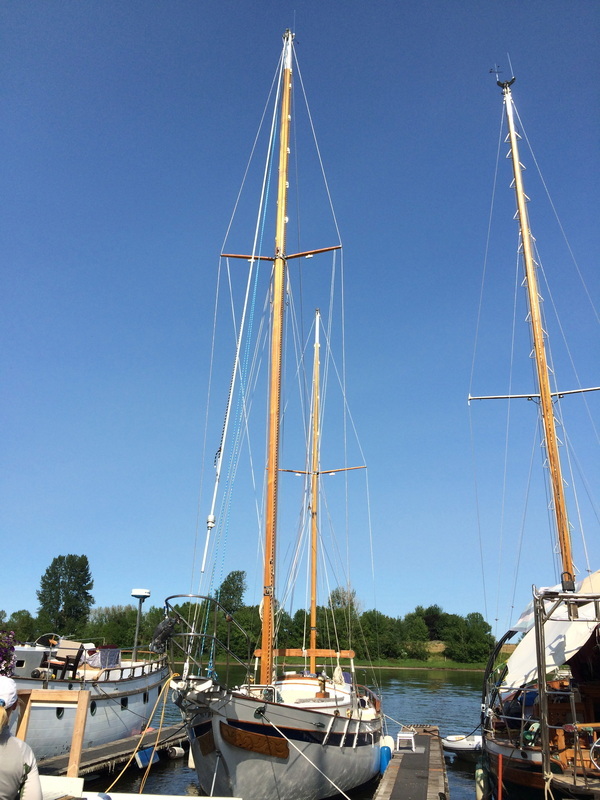 Late Winter, early Spring (when everyone goes to Mexico) found us hustling to get all the sundry deck tasks done so we could return our focus to the project that started the whole restoration enterprise: putting the masts back on! 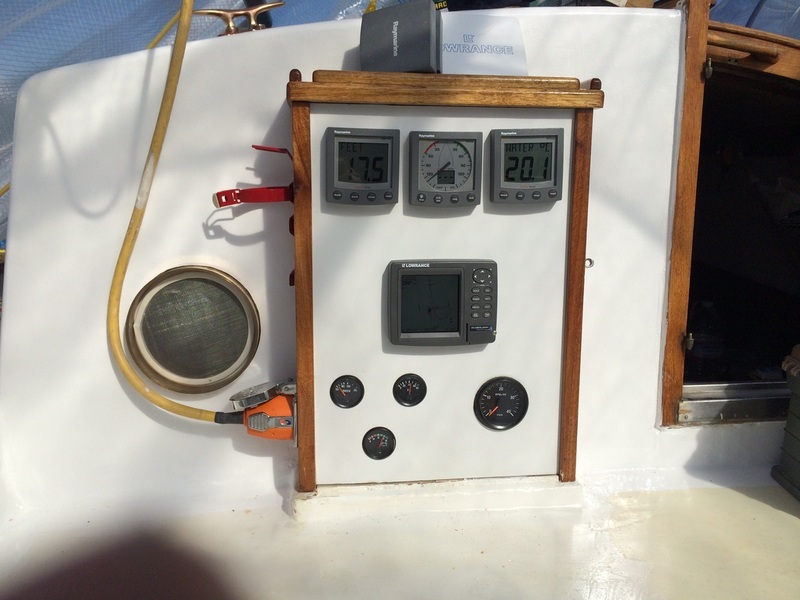 Fitting the engine/sailing instrumentation against the new wall and deck was essential in completing the cockpit. 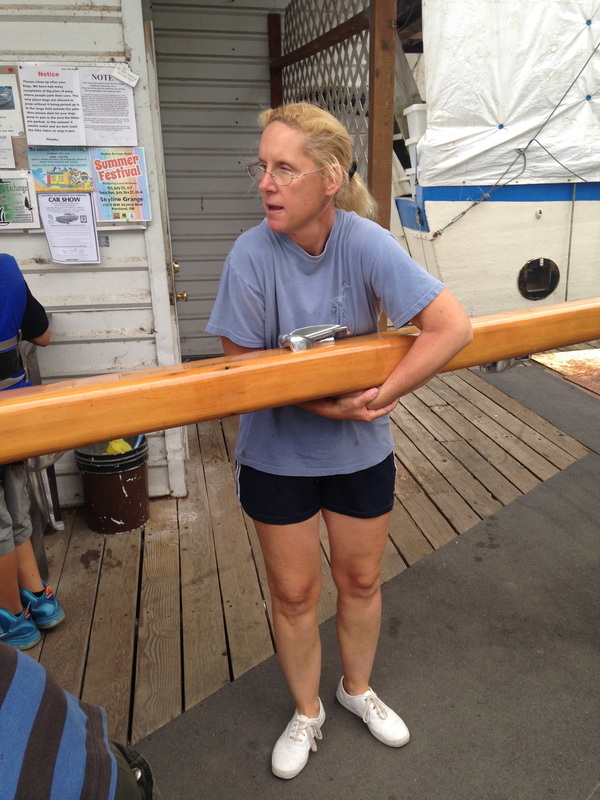 Being able to reattach shore power was pretty handy, too! 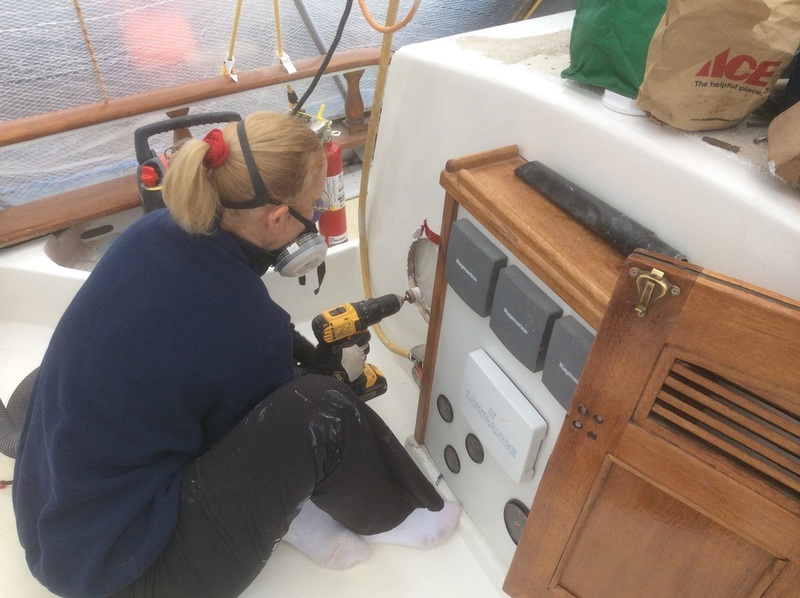 Gabrielle, smoothing off the rough fiberglass edges, allowing installation of our new aft portlight. 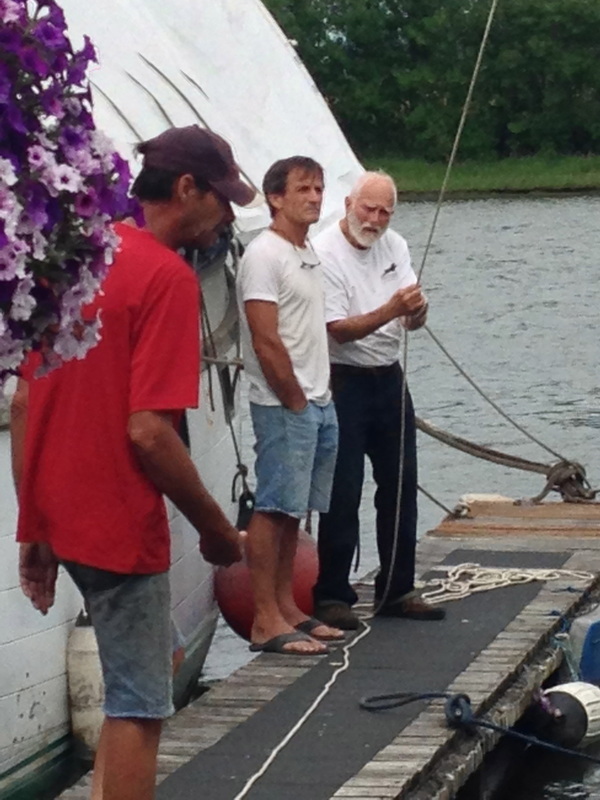 ..."Bob Villa here, for This Old Boat." 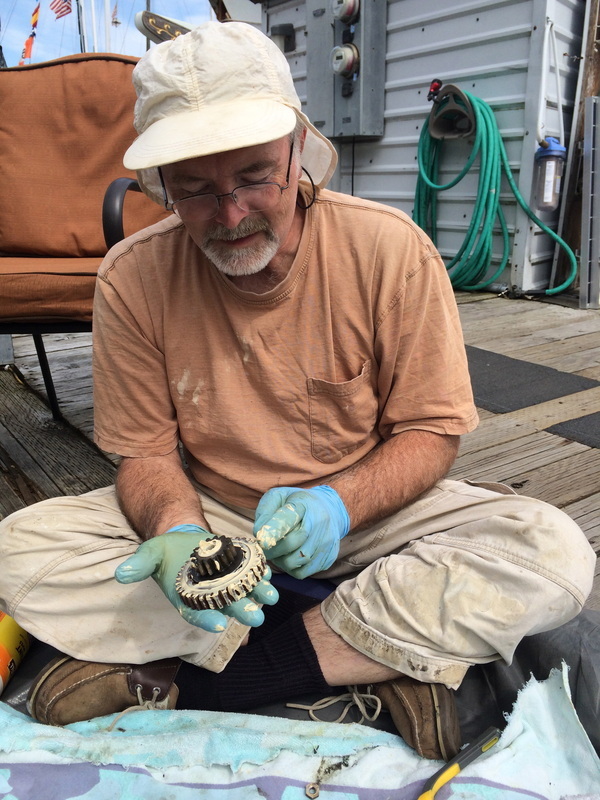 Michael putting a blower vent plate on the steering box before installing it back on the boat. 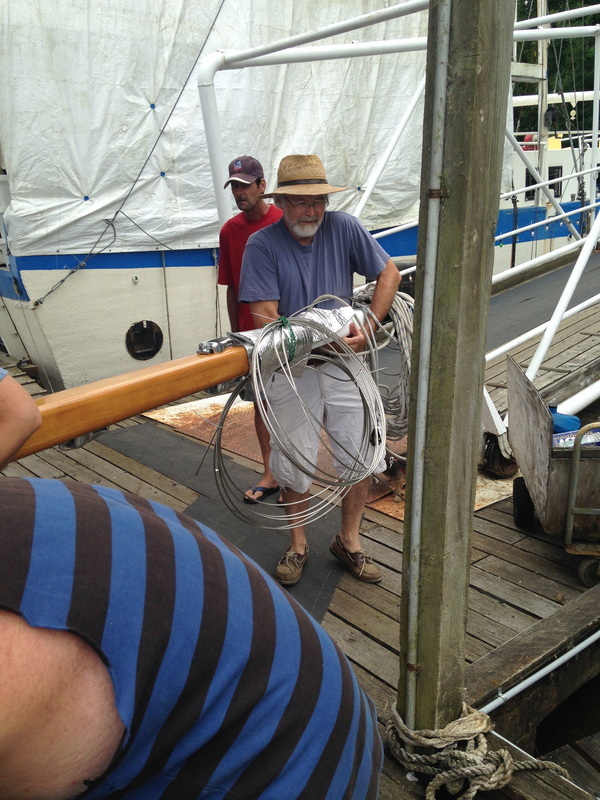 Another monumental moment: wheeling the steering box with its new 'sidesaddles' from the storage shed to the boat for attachment to the deck. 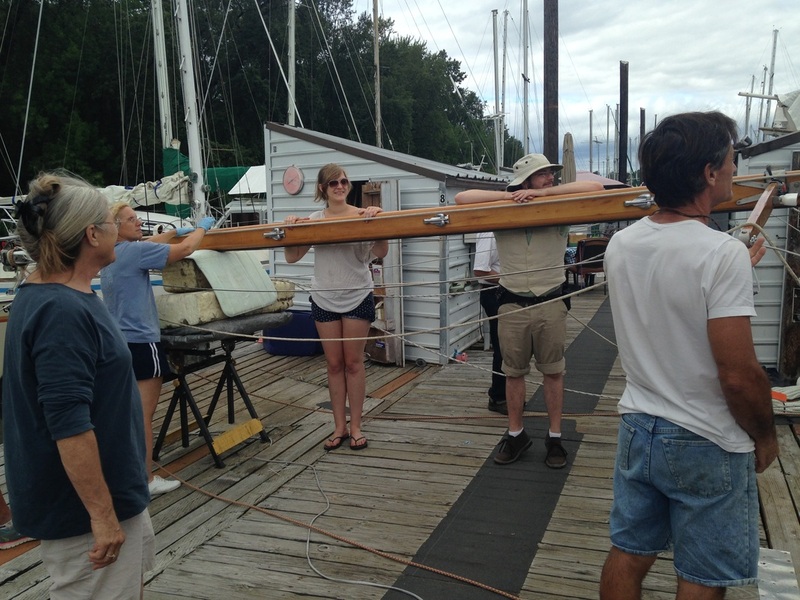 Gabrielle, serious, as she attaches hinges for the canted helmsman's seat. 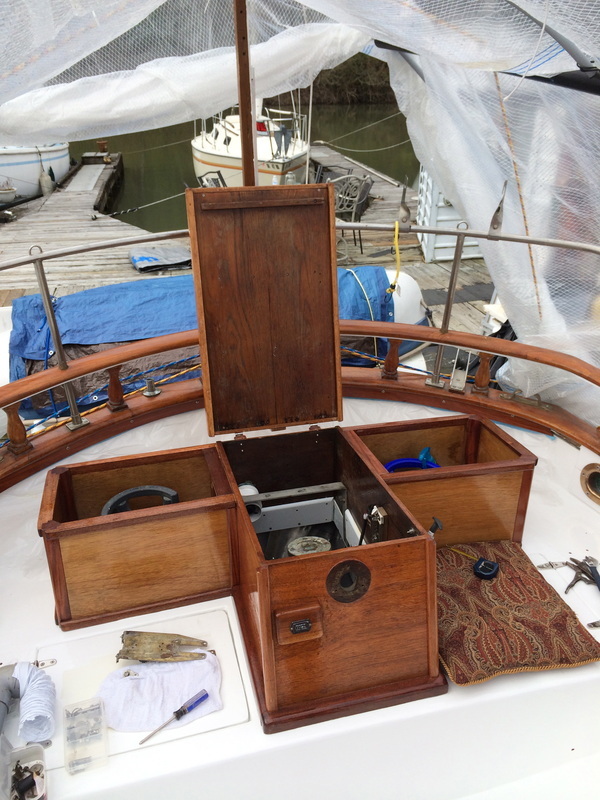 With the box in place, now comes the reconditioning of the worm-gear steering and insertion into place. As it turns out, it was much easier to say than do. Unseasonably nice weather turned the 'greenhouse' into a 'hotbox.' Temps soared inside up to 100 degrees! 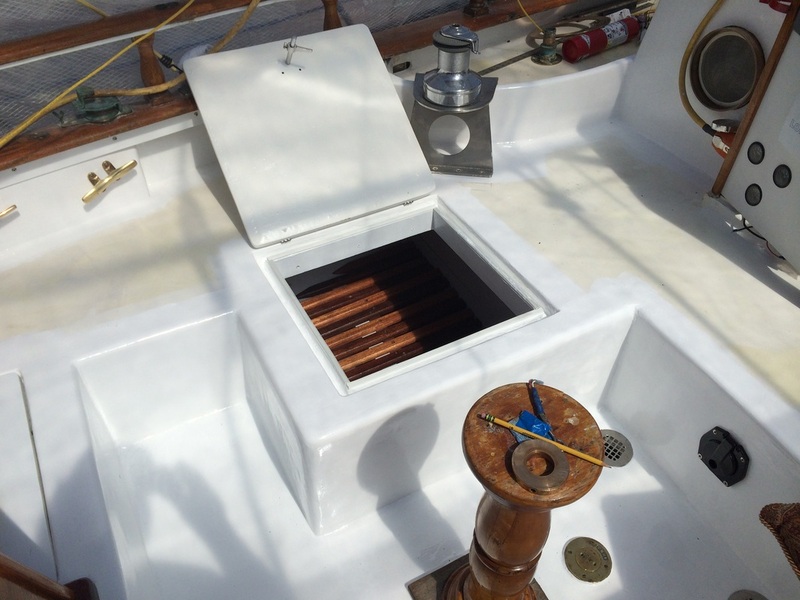 It was an immense help to be able to lift the stern cover and let the heat out. Our rope locker grating was so pretty, it was hard for us to break down and close the door! 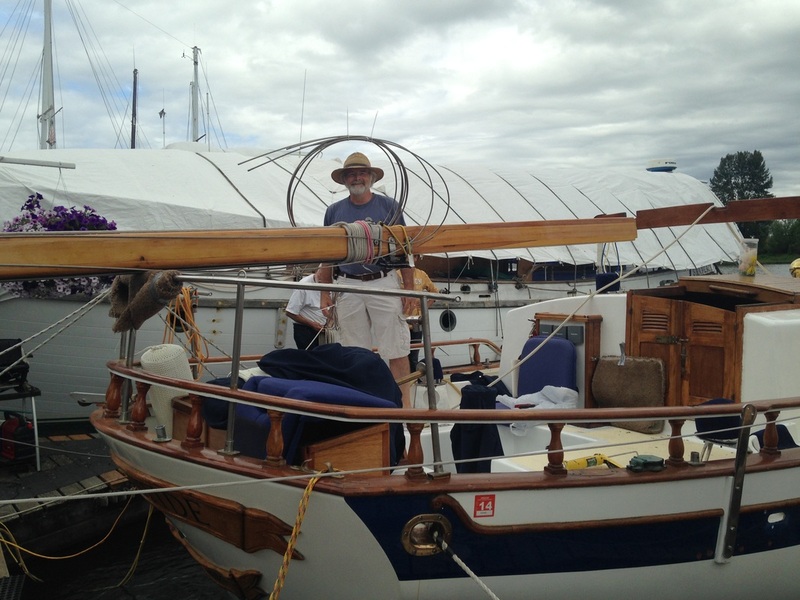 Instruments reattached and working, and the new portlight in place. 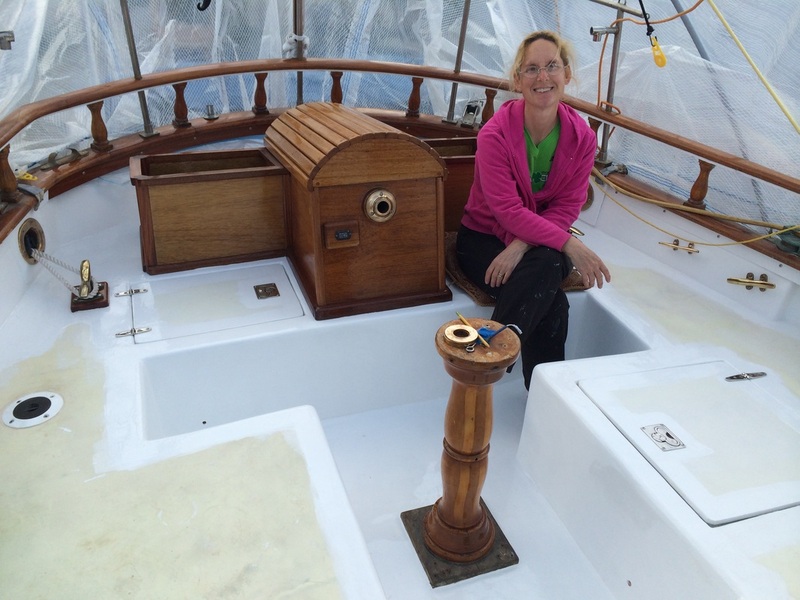 Gabrielle takes a moment to enjoy all the bronze fittings she polished with such meticulous care. 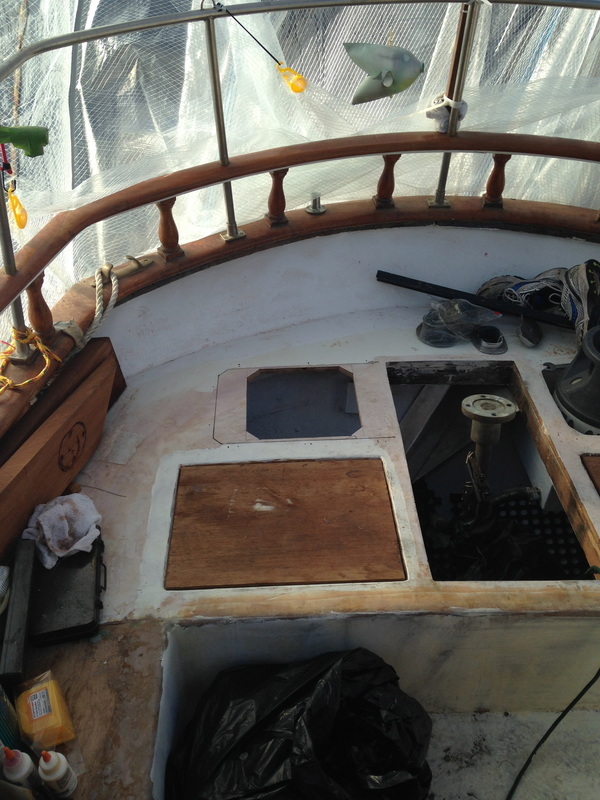 With edges masked, the deck is finally ready for Kiwigrip textured paint! 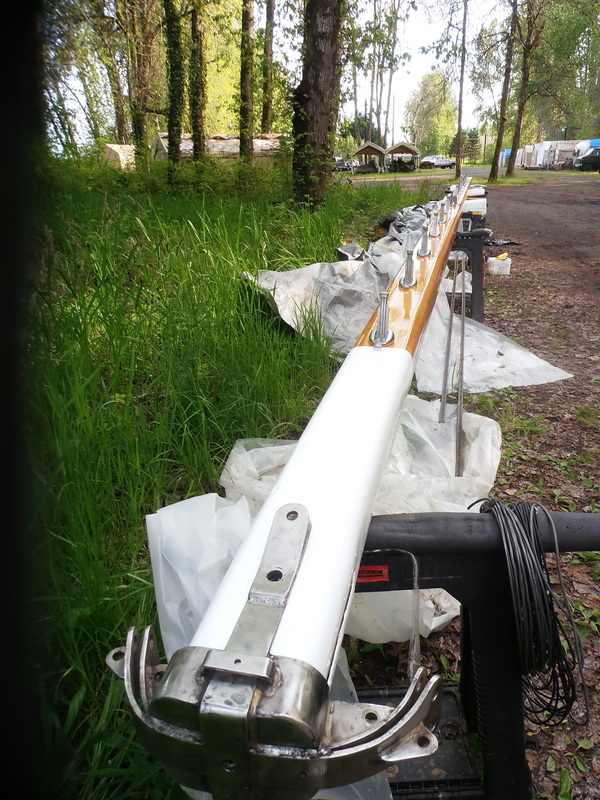 On the last days of April, Gabs, Michael, and our neighbor Rivers inveigled the masts from their hiding spot in Fred Phaler's shed out into the open lot. 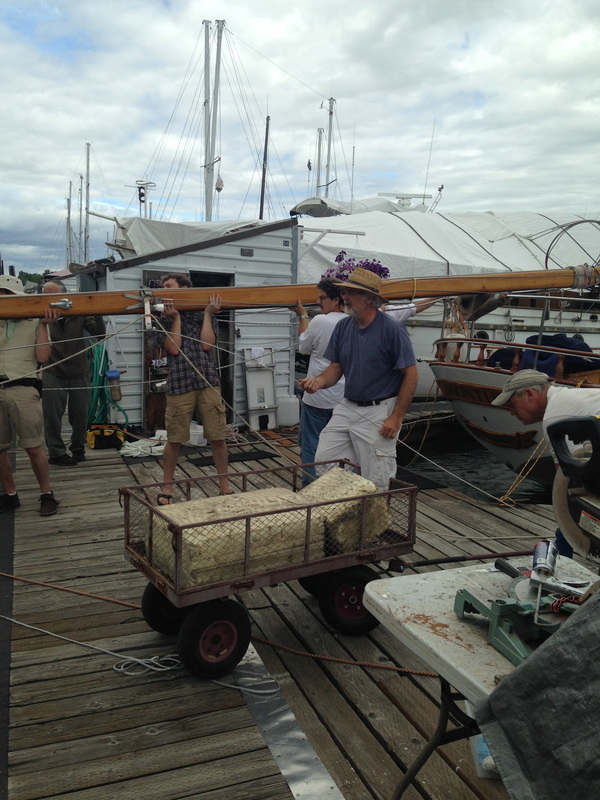 Once there, we promptly covered them with tarps. 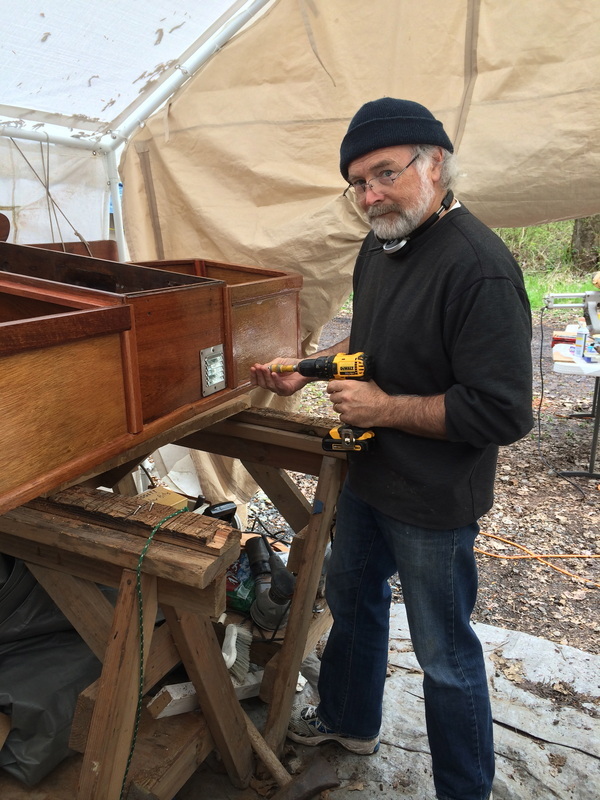 This made them accessible for the work of putting hardware back onto the pristine varnished wood. 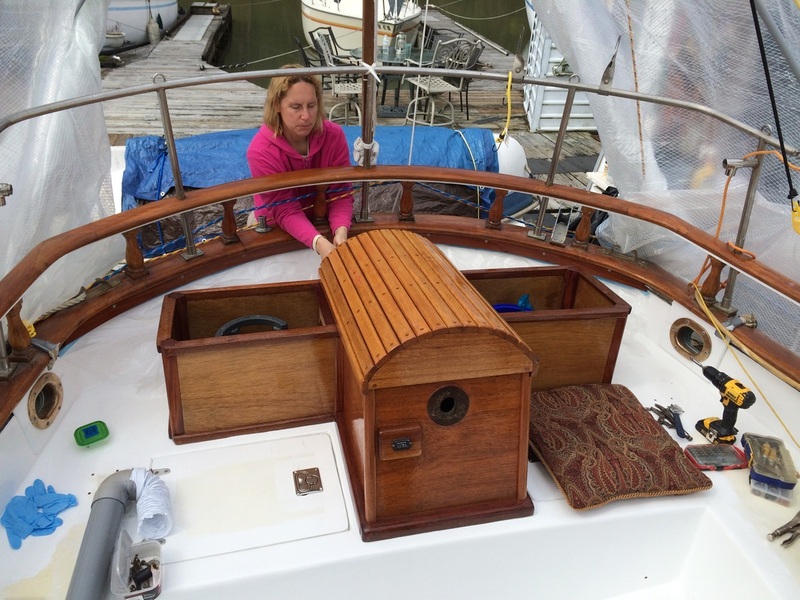 Gabrielle wipes raindrops from her 13 coats of Bristol varnish. What will she do when they're upright?!?!? 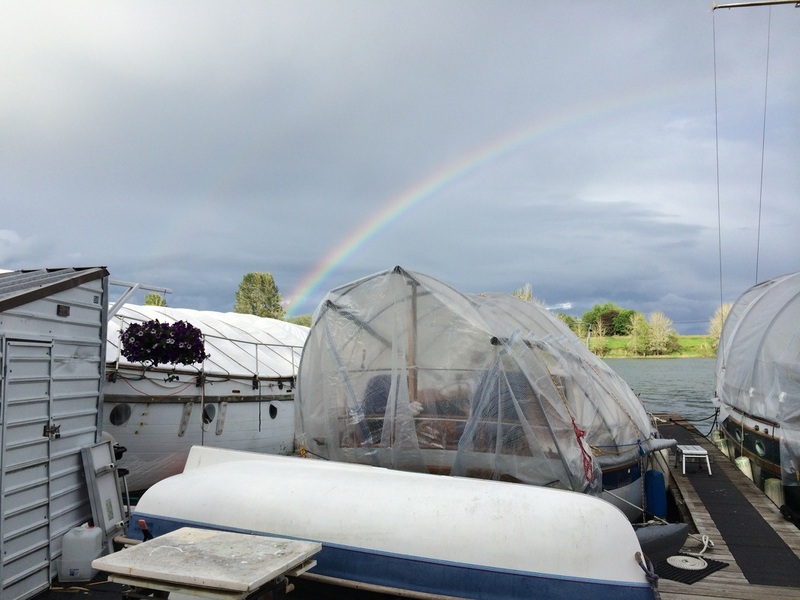 It's either a good luck omen, or ET just left Sauvie Island for home! Even doing construction, Pirate's Cove is a beautiful place to be. A forested hill on one side, and farms and a wildlife reserve on the opposite bank, it is home to beavers, otters, osprey, deer, eagles, and the occasional jumping fish. I say, not a bad lounging spot! Michael "tests" the saddlebag seats. 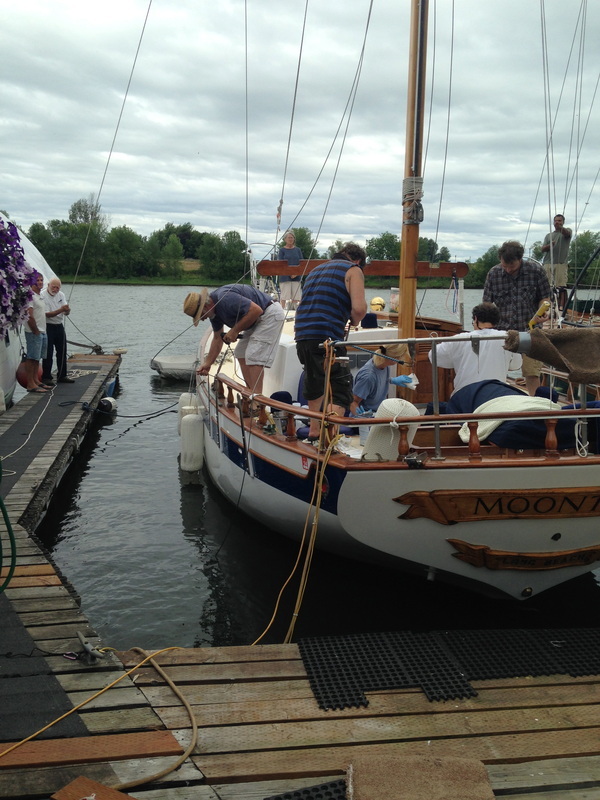 Moontide, showing off some spit n' polish, and fresh paint. 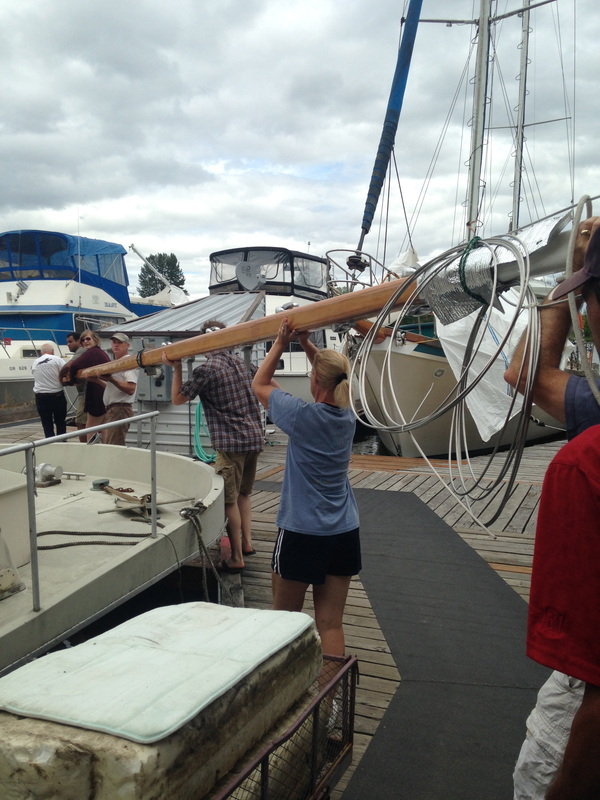 Lots of pieces to fit on the mast. That means lots of holes to drill! Gaak! 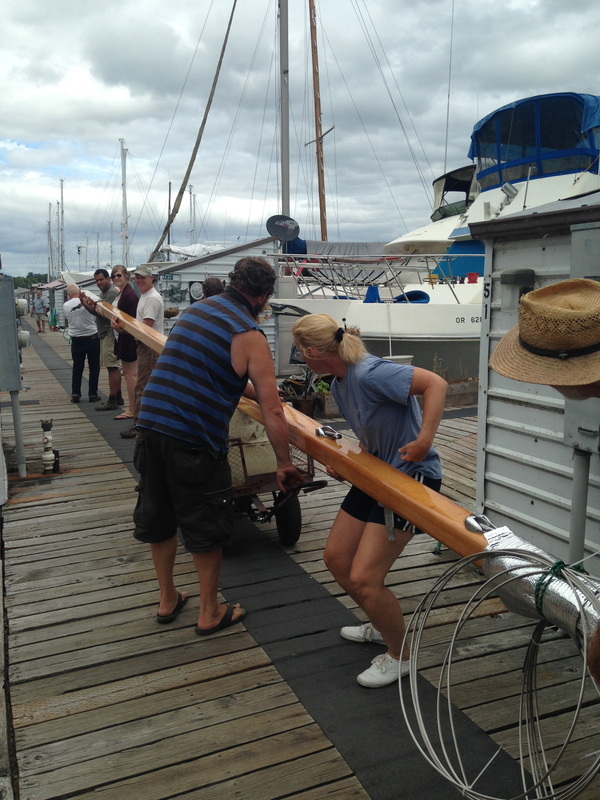 How to self-step your mizzen mast: First, find lots of people willing to help! 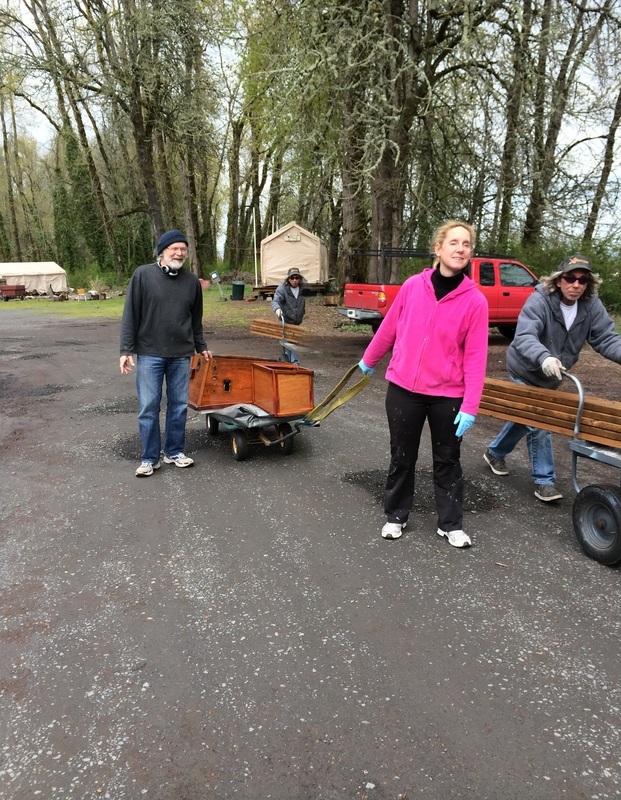 Getting down the ramp is our first challenge. 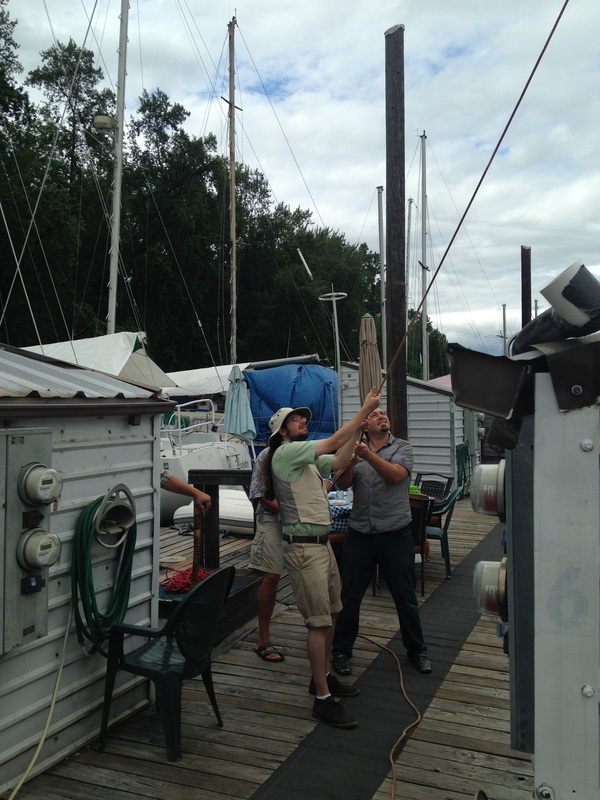 Lining the mast up with the dock. Then get around the corner... careful! 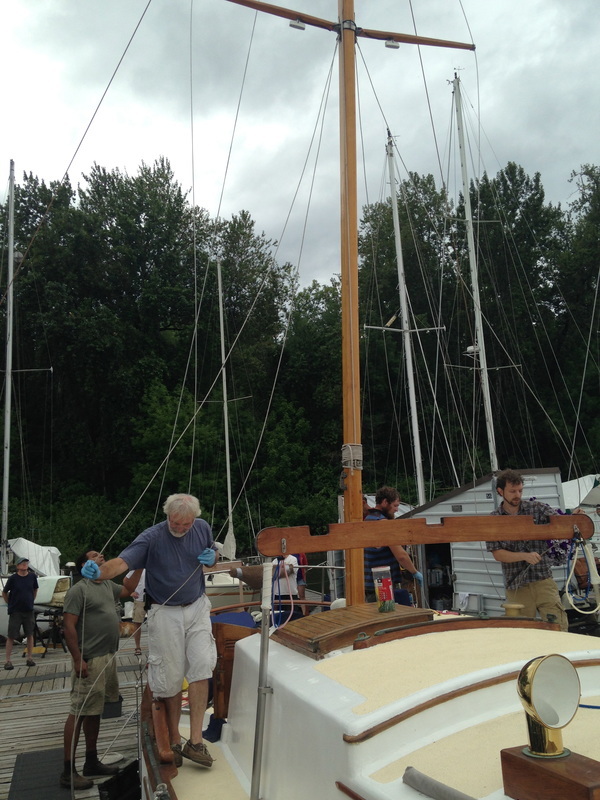 Setting it up to attach spreaders to the mast. 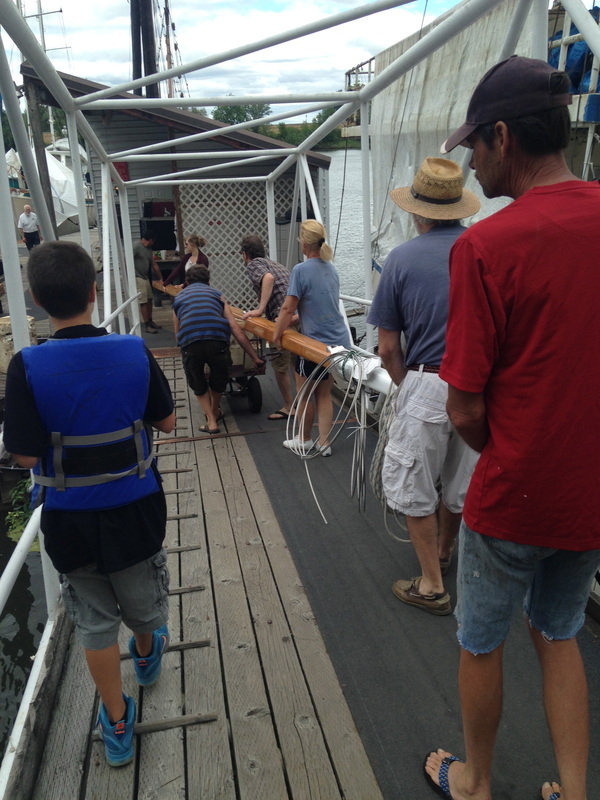 On to the back of the boat. 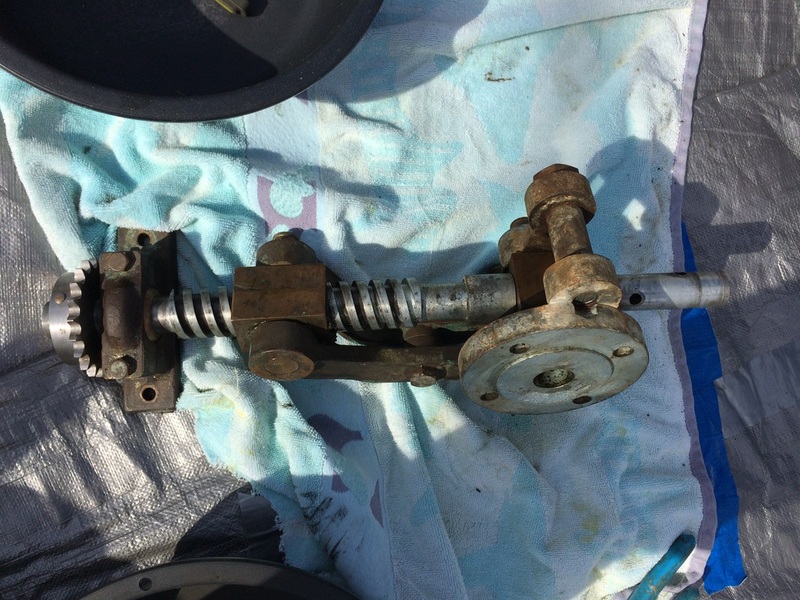 is this the heavy end? Why do I always get the heavy end? 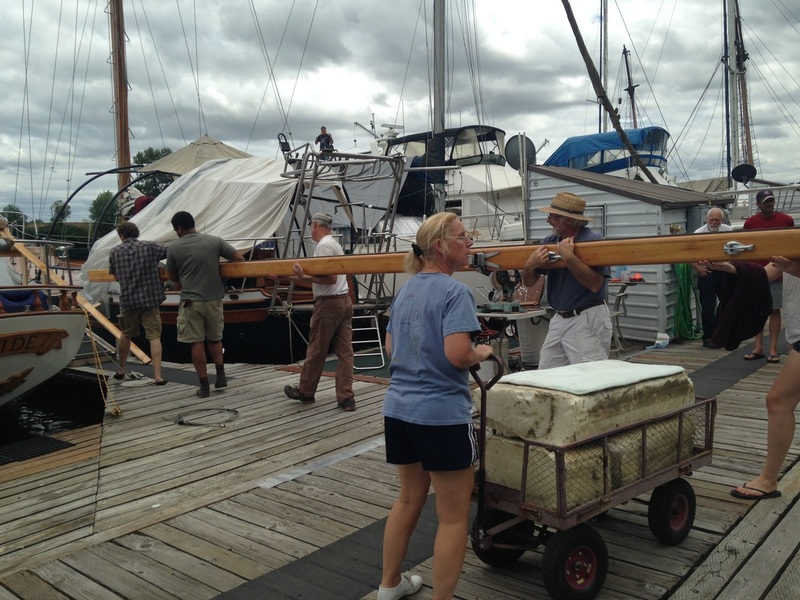 Special delivery: One mizzen mast to Moontide. No, this one goes here... I think. 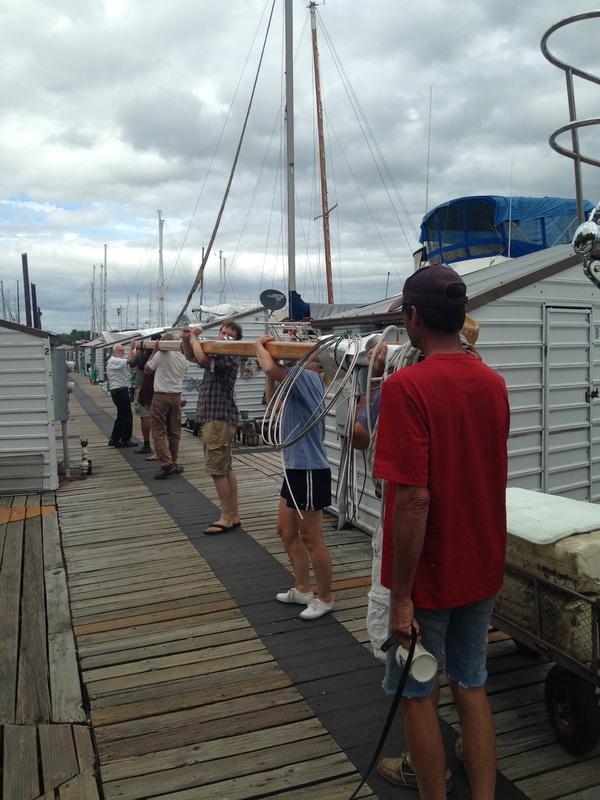 We have our mizzen mast! 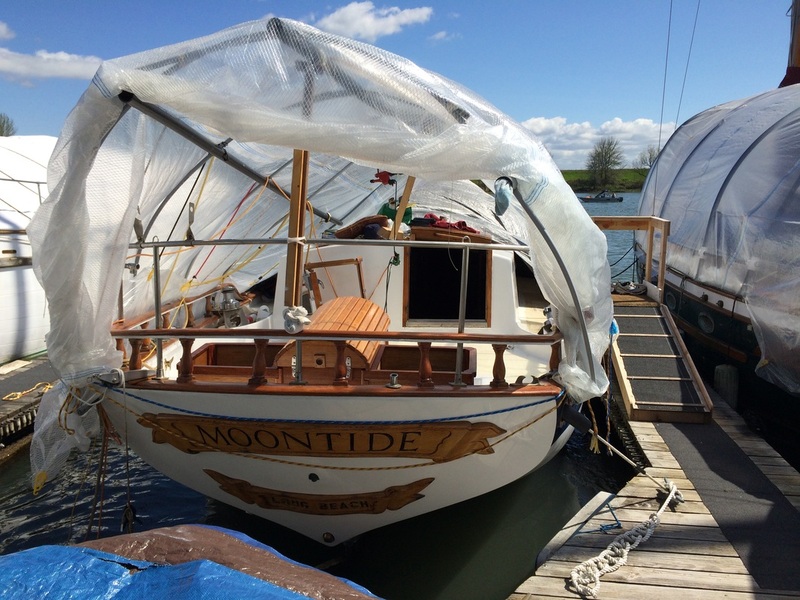 At the end of July, Moontide had her bottom painted at Rocky Pointe Boatyard, and Allison Mazon did a partial survey of the outside of the boat. So far, so good! 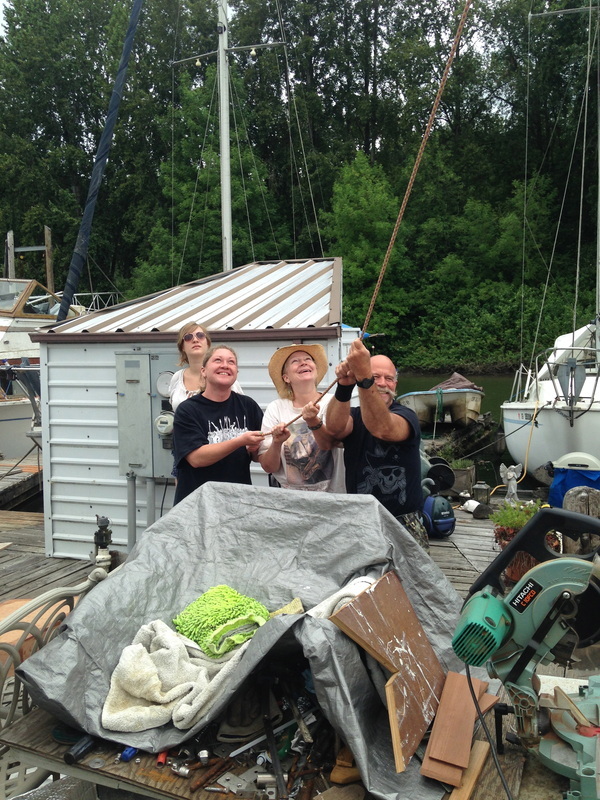 Today the mainmast was stepped! 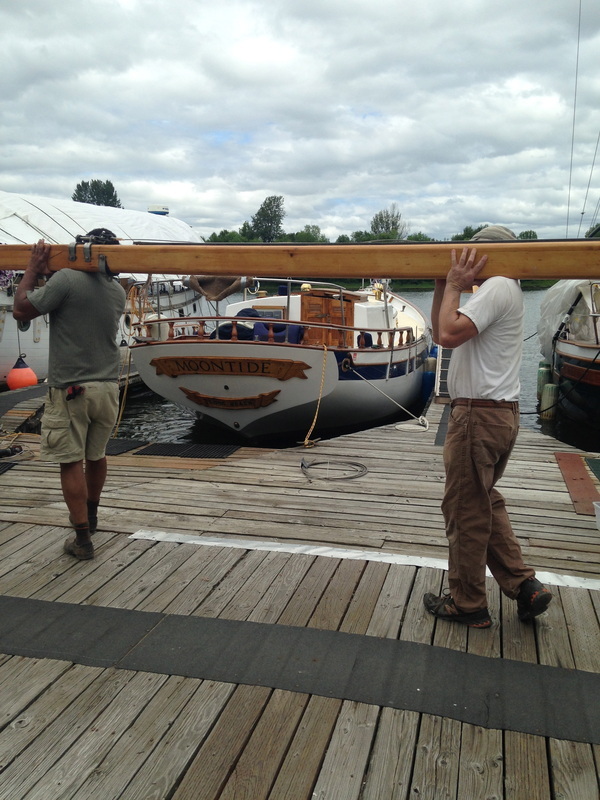 The boat was returned to Rocky Pointe, and they used the travel lift to ease the 900+ lb mast onto the boat. 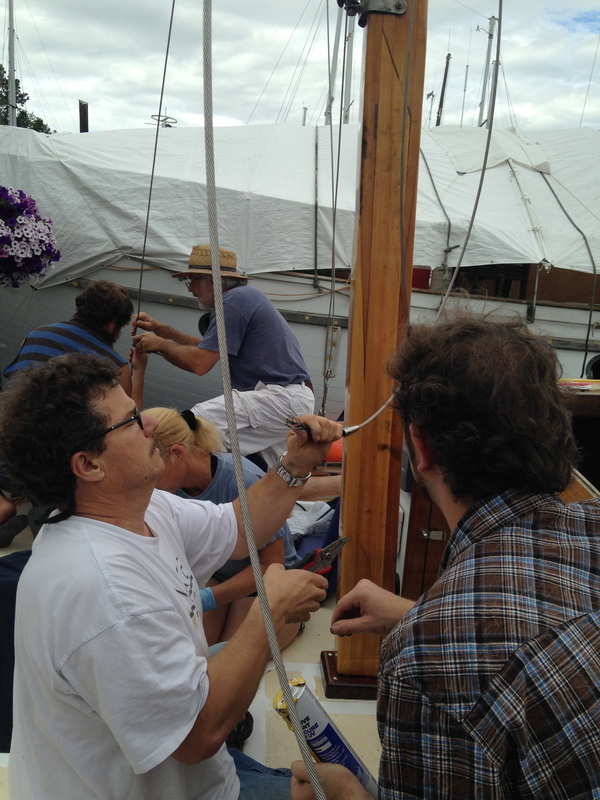 Folks who helped Gabrielle and Michael place shrouds included rigger Ian Weedman, Jason Bent, Dar Nelson, and Kim Winkler. Thanks to everyone!